Cork’s RedFM is celebrating as Ray Foley has helped the station become the top breakfast show in Cork for the first time in its 16 year history. Well known Irish Broadcaster Ray Foley joined co presenter Jason Coughlan last March to present ‘Breakfast with Ray & Jay’ on Cork’s RedFM and according to the latest JNLR/Ipsos MRBI report into radio listening 55,000 people are tuning into the comic duo each morning. The show has recorded an increase of 14,000 listeners compared to this time last year and are now 8,000 ahead of Morning Ireland on RTE Radio One which is the second most listened to show in Cork. In addition to the Breakfast show reaching the top spot, Cork’s RedFM has cemented their position as most listened to radio station in Cork with a boost in figures across all weekday daytime shows following the latest report which covers 12-month period from January to December 2017. A record number of 144,000 people are now listening to RedFM every day which is over 18,000 ahead of its nearest competitor. 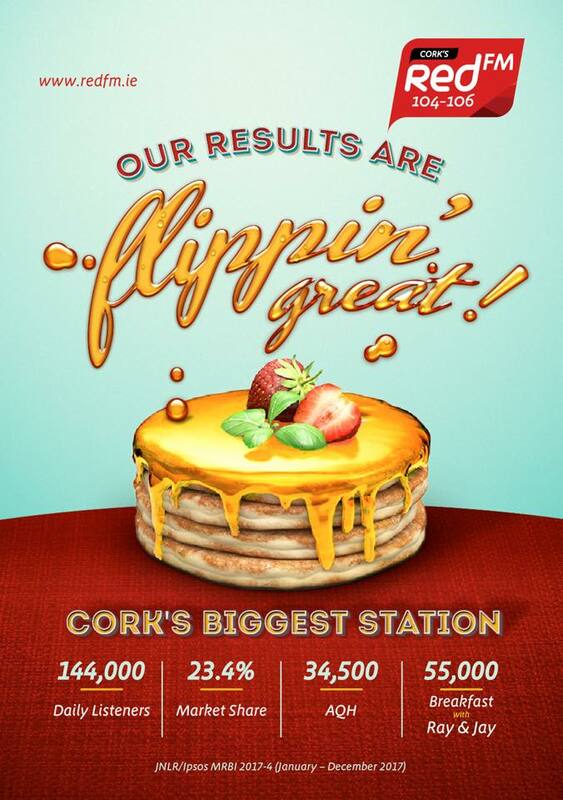 Speaking about the results CEO of Cork’s Red FM Diarmuid O’Leary said “We are delighted with the latest JNLR results which are the highest in the stations history and keep us at the top of radio listening in Cork. The fact that we now have the top breakfast show in Cork is a fantastic achievement and in particular the fact that Ray & Jay have grown the audience by 14,000 with a new show in the last year is phenomenal”. The latest JNLR figures also confirm Irish radio’s stronghold on the hearts & ears of Irish audiences with more than 3 million people tuning into Irish radio on a daily basis. Gabrielle Cummins, Chairperson of the Choose Radio group which represents all of Ireland’s radio stations to help promote radio said “there is nothing to compare to radio to reflect the mood of the nation. Whether it’s the whole island celebrating Ireland’s last gasp win against France in the Six Nations or the country pausing as one at 12 noon on January 23rd to listen to radio’s tribute to Dolores O’Riordan - radio unites its listeners in a way no other medium can”.